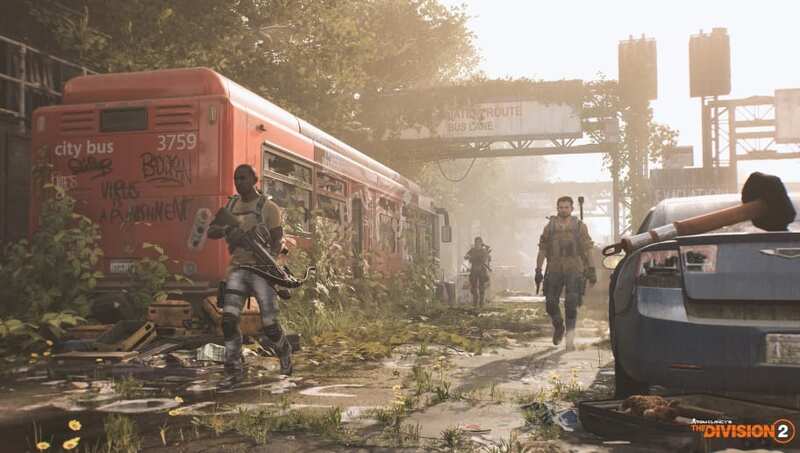 The Division 2 Hunter Mask locations are where players can pick up some of the showiest trophies in the game. It takes some doing, but sporting one of these 12 masks is a sign of true Division 2 expertise. Here's where to find them. First reclaim the Washington Monument Control Point after 7 p.m. if it's been taken over. Go down the elevator shaft to the Supply Room. Head to the other side of the stone monument and press the button there. Visit the three grave locations it highlights on the map and use the salute emote at each. Return to the Supply Room and press the button again. Go to the new location it marks northwest of the monument. In the area marked “Missing Persons,” turn to the right and look to the crane by the shipping containers to see the hunter. Grab the strongest single shot weapon you have and give it all the damage bonuses you can. Anything less than a one-hit kill will allow the hunter time to disappear. If you miss, wait a full in-game day cycle before pressing the button again for another shot. Start the same way you did with the Ghost Mask, saluting all the requisite graves. After looking at the monitor with the orange circle, leave the monument and go northwest to the space between the two northern circular paths. Find a building on the map near where the two circles arch. Head slightly away from the building, as getting too close will cause the hunter to disappear. At the southwest of the map, along Henry Bacon Dr NW, you’ll find some underground locations. Head to the southernmost ladder on your map outside the Lincoln Memorial. Interact with the laptop in the hideout to reveal a map. Follow the map to the east of Daniel French Dr SW. Along the path you’ll find a piece of scaffolding with a single lit bulb. Shoot the bulb and kill the agent that spawns. Head to the circular building on F St. NW near the river. Do the Jumping Jacks emote by the nearby swimming pool to spawn two hunters. Kill them for their two masks. On the east side of D.C., find the road marked “Ramp” near Interstate 395 BN. Shoot out the light shining onto the veteran memorial on the left, then get out of the water and use the salute emote. A hunter will emerge from the smoke that you can kill for the mask. In Downtown East, south of the Stronghold, you’ll discover a courtyard surrounded by buildings. Find the mirror flanked by two doorways toward the south. Enter and interact with the computer. Head back out the doors then through the left door of the double set. Use the phone on the desk to spawn the hunter in the courtyard. From the Christmas tree courtyard, head east outside for the chance to meet a fourth hunter. While it's unclear exactly what causes this hunter to spawn, it appears related to the previous three. From the control point near Pennsylvania Ave NW, go to the building opposite the control point to the east. Descend the escalator, then circle around to the second set of escalators and ride them up to the central area of the mall. Climb the nearby platform and shoot the four targets in the windows. Shooting the fourth will spawn the last hunter you need to kill before you complete your collection.